This month I got a few new things from Mac so this post may seem a little heavy on the Mac side but its been a long time since I've actually wanted anything from there that I've enjoyed testing out some new things! Mac Soft & Gentle- I decided to pick this up on my birthday after months, if not years, of admiring it but never taking the plunge. I am so incredibly glad I finally added this to my collection as its bloody gorgeous! It's a light gold/ bronze toned highlight which isn't usually my thing but I think this one compliments my skin nicely. The name is very appropriate as it gives a 'soft' highlight but you can totally build it up for a more striking look. Mac Warm Soul Mineralize Blush- Something else I kept looking at but never buying, who knows why! This blush has been my go to this month, without a doubt. It's a light terracotta shade that has a hint of a shimmer to it, I like this in a blush because it gives a subtle glow without look too full on and 'highlighter like'. For the warmer months this is just the perfect shade and it's been packed to come away with me on holiday. 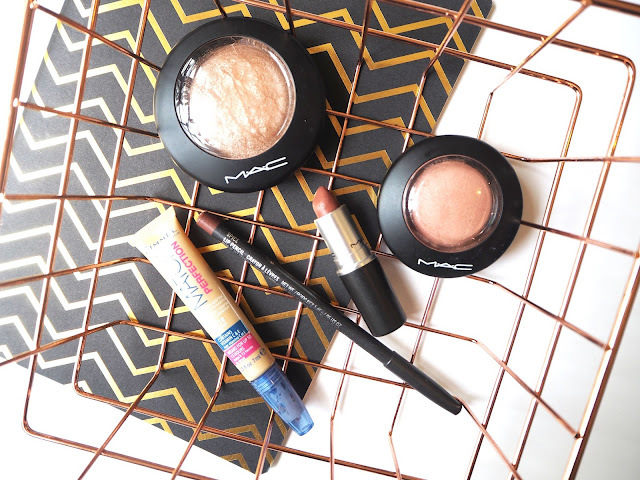 Mac Spice Lipliner & Mac Spirit Lipstick- what a duo these two make! Ok, so admittedly I haven't loved this throughout the whole of June as I only got Spirit last week (so I'm cheating a tiny bit) but since I got it I have been completely obsessed, especially once I discovered how amazing it looks with Spice lip liner. This colour is unusual in that it isn't really a brown and it isn't really a pink, it sits somewhere in between the two. This makes me an even bigger fan because it means it goes with lots of different make up looks and is so easy to just chuck on every day. Rimmel Match Perfection Concealer & Highlighter- how happy am I to have discovered this? Er, very. This concealer has quickly become my lifeline for perking up dark under eyes. I do use it sometimes on its own but often I will layer it over another concealer as it doesn't have the biggest amounts of coverage. What it does very well though is brighten, brighten, brighten. It also blends very well with other products so it gives a natural, seamless finish. The only thing I don't like about this is the built in brush applicator as I find these tend to get a little gross after a while. Paco Rabanne Olympea Eau De Parfum- I am so, so pleased to have this scent back in my collection. It's the most beautiful floral scent that I just love wearing in the summer, I first got this a couple of years ago in Portugal so it always reminds me of that time when I spritz it. Considering I only got the bottle at the start of the month I've gone a fair way through it already, oops! It really does smell amazing though so if you're looking for a new summer scent then I couldn't recommend this one enough. What products were you loving throughout June?